From Goodreads ~ Is "The Wire" better than "Breaking Bad"? Is "Cheers" better than "Seinfeld"? What's the best high school show ever made? Why did "Moonlighting" really fall apart? Was the "Arrested Development" Netflix season brilliant or terrible? What's the greatest TV show ever? 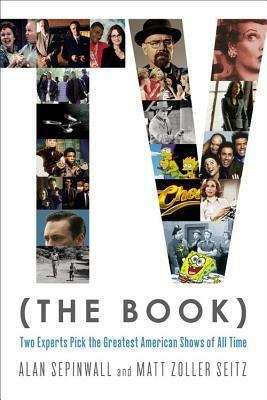 That debate reaches an epic conclusion in "TV (The Book)". Sepinwall and Seitz have identified and ranked the 100 greatest scripted shows in American TV history. Using a complex, obsessively all- encompassing scoring system, they've created a Pantheon of top TV shows, each accompanied by essays delving into what made these shows great. From vintage classics like "The Twilight Zone" and "I Love Lucy" to modern masterpieces like "Mad Men" and "Friday Night Lights", from huge hits like "All in the Family" and "ER" to short-lived favorites like "Firefly" and "Freaks and Geeks", "TV (The Book)" will bring the triumphs of the small screen together in one amazing compendium. Sepinwall and Seitz's argument has ended. Now it's time for yours to begin! In the late 90s, the authors worked together covering TV for New Jersey's largest newspaper. Their careers have gone in different directions but they have come together to write this book. They start with a lengthy debate about how to pick the best show of all time. The discussions about the shows are at a high level. I watch less TV now than I have in the past and there were shows listed that I had forgotten about. There were some older shows on the list like I Love Lucy and Gunsmoke, right up to shows that are still on today. One thing that bothered me, though, was when they covered Maude. They talked about some of the events of the show like when Arthur started drinking and lost his business, etc. This is incorrect. Arthur was the next door neighbour and it was Walter, Maude's husband, who this happened to. Once I read that, the authors and the book lost some credibility with me.